The holiday shopping season is in full swing and if you are struggling to find the right gift for that special 3D printing fan in your life (or possibly even yourself), then stop by Wednesday, December 11th, to check out the Form 1 from Formlabs. The Form 1 is on the cutting edge of desktop 3D printing. A true SLA printer, the Form 1 uses guided lasers to cure liquid resin into the desired model. The print quality provided by this technique leaves FFF printers in the dust. 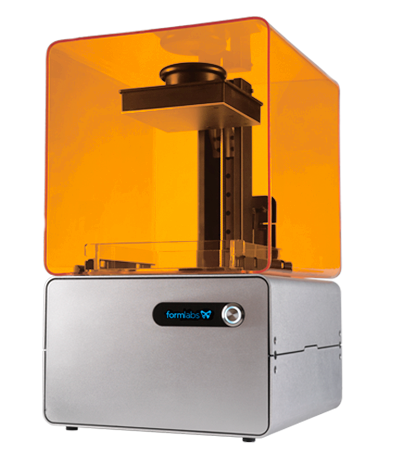 The Formlabs team will be joining us at 7pm at AS220 Labs. This is a great opportunity to ask questions and see examples of what this printer is capable of and hopefully see it in action. Of course we will also have a few other machines on display and the regular crew will be there to answer any questions newcomers might have. Since this is our holiday meeting we will probably stick around late so if you can’t make it on time, don’t hesitate to stop by later but since the Form team is heading down from Boston we will be starting their portion on time (for once).